Learning how to water efficiently and proactively to improve the overall health and appearance of your landscape. Watering: It’s a hot topic when it’s hot! Unfortunately, most homeowners have been misinformed when it comes to watering practices. That’s why we are here to simplify things with our watering guide – AKA the soak, cycle, repeat method! What are the steps to our watering method? First, let’s determine what type of system you are using. Our watering guide is tailored for sprinkler systems with pop up and rotary heads. 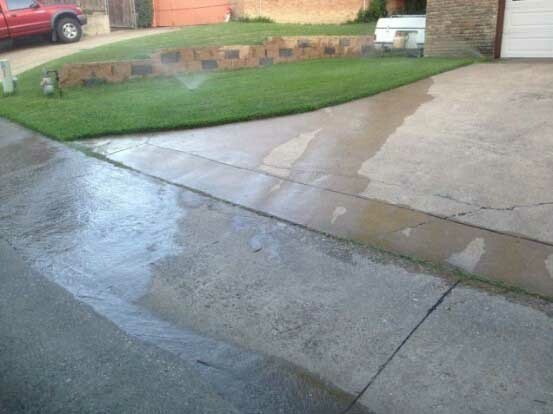 If you do not have a sprinkler system you will need to get creative. We suggest investing in a digital controller box which can be found at any home improvement store. If you have a drip irrigation system, consult your drip irrigation installer for proper watering regimens. Second, let’s analyze how you’re watering. Do you water your lawn all at once and if so, for how long? If you’re only watering using one cycle, then all of the water you deliver may not get absorbed. Our tough clay soil presents unique challenges when it comes to lawn irrigation. Due to our seemingly nonporous clay soil, the trick is to split up your watering times into multiple cycles, all in the same day. Clay can only soak up so much water until its pores close up and water begins to sheen off. Therefore, after an allotted amount of time (which is anywhere between 3-10 minutes depending on the slope and compaction) runoff occurs and water becomes wasted. Why is water runoff bad? Irrigation water that can’t be absorbed into the soil will drain off into the street, down the storm drains or into our lakes, rivers, and drinking water supply. This is bad for many reasons. First, it is a huge waste! There’s no sense in wasting all of that irrigation water if half of it is just going to end up in the storm drains. Plus, water runoff takes a lot of desirable and undesirable things away with it: nutrients your plants need plus toxic pesticides and fertilizers. Even if you are 100% organic in your garden, there is still soil sediment (erosion), pet waste, and other toxins that make their way to your yard to be carried away by the runoff. When you see it start to runoff, shut it off! Make yourself a cup of coffee on Saturday morning, stand outside, and start your stopwatch when the sprinklers turn on. Once you notice water running off onto the street or sidewalk, stop your watch and now you have your optimum water time for each zone. Third, now that you have figured out your optimum cycle time, it’s time to program your cycles on your controller box. Most controller boxes allow for 3 or more start times. The key is to water each zone for a total of 30 minutes. You’ll want to break the cycles up into factors of 30. See sample below for more clarification. Timing Sample: If your system allows for 3 start times, then you will water each station for 10 minutes, 3 times – breaking for an hour or two in between cycles to allow for deeper penetration. Less watering time at more frequent intervals is recommended if your system allows. In other words, if you can water each station 5 times for 6 minutes, that is better than watering each station 3 times for 10 minutes. Optimum watering window is midnight-10 am. Be sure to adhere to local watering restrictions and assigned watering days. Healthy soil that is part of our Soil Building Program is naturally better at absorbing and using water efficiently. When your soil is healthy, well fed and full of organic matter, drainage and moisture retention is improved.